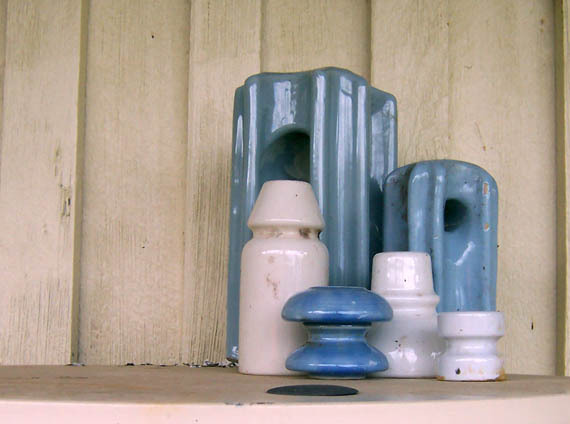 I didn’t used to collect insulators. What happened was, I went into a tip shop one day and saw the two larger white ones. I hadn’t seen that type before, so I grabbed them… thinking I could do something with them of course. I had tons of the small white ones – from the electric fence I’d put up in Fentonbury. Then my friend Diane told me about her insulator collection and showed me photos of some really amazing ones… Who knew insulators were collectable? So, when I saw those blue ones in a shop recently I had to have them. Firstly cause they’re a nice colour and secondly cause now I have a real collection. They say having 3 of something makes it a collection. If that’s so, then six is way up there. Anyhow, just thought I’d share my newest collection. The dishes. Some washing, some hanging out of washing, some bringing in of washing when it rained. Brought up some firewood to light the fire cause it was cold. Groomed dogs. Discovered that my customer database had corrupted and, since I didn’t have a backup, started it all over again. Did the grocery shopping. Made a salad. Entertained visitors. Spent quality time with Ben while the poodles rampaged in the top paddock. Work on the website. Pay bills. Work on any suncatchers or chimes. Crossed anything off the list. Better go finish that database. What a pain. I learned my lesson though… from now on I’ll have three copies: the one I use and two backups. This entry was posted in 31 days, thrifting by zefiart. Bookmark the permalink.